I've been a little neglectful of the blog of late. Real life stomped through the door uninvited, turned 2013 into a big bundle of rubbish and left even a little light blogging a stretch too far. Beyond turning up at Easter Road and groaning quite a lot at what I've been watching, Scottish football has been a care too much. I have, however, found the time to sign up for a season ticket renewal. Which makes me a muppet. Muppetry, some will say, is a particular requirement for life on what nobody should ever call the Hibee highway. But there we are. On that score muppetry courses through my veins. I'm well beyond the stage of buying a season ticket with high hopes for a summer of constructive, yet prudent, spending that lays the foundation for a season of thrilling accomplishment. Far easier to expect a summer of underwhelming transfer market dealings, a panicked spate of loan signings and a season of distinct underachievement. It deadens the heart to the disappointments that follow. That's the strange thing about season tickets. If you're not just buying out of habit, you're leaping before you have a chance to look at the squad that might break the pain of your fall. "Here's my money Mr Petrie, I'd like you to spend it on a decent squad but I've noticed your jacket buttons are a bit strained of late so if you want to fire up to Slaters and blow the lot on suits then go for it, nowt I can do about it anyway." As my justification for getting a season ticket is "it keeps me out of the pub" I can hardly complain. Except this year I probably can. And so can fans of any other club in the country who have taken delivery of their club's annual begging brochure. Because this year they really are doing little more than mug fans. "Renew your season ticket. And we're offering a special deal for all our loyal fans this year. "For the same price, or more, as last season you can watch an as yet unsigned team play in an as yet undecided league structure under the auspices of an as yet unconfirmed organisation. "And if you sign up before 1st April you'll get a fiver off our as yet unreleased new fifth shirt." (I should say that my season ticket renewal cost the same as last year but this time I've got a "cup top up" as well. Obviously the cup top up might be worthless. But still - it's the same price as I paid for the dull, run of the mill league games this season. Is £405 for a seat at Easter Road value for money? The answer is both entirely subjective and completely obvious. Of course it's not value for money. But think of the cost of the pints I might drink, the legal fees that I might run up during my short descent into alcoholism if I wasn't at the football every fifth Saturday and every third Friday/Sunday/Monday. I used to tune into Watchdog to see Lynn Faulds Wood feign sympathy as daft folk looked mournful because the hotel they stayed at in Benidorm didn't look like it did in the brochure. Then they'd hold up the brochure and show a lovely drawing of a nice hotel. "It's a drawing," I'd think. "What did you expect?" Now I've joined them. I've bought a season ticket to watch an artist's impression of a league structure. Or, as we're dealing with Neil Doncaster, David Longmuir and their parcel of rogues, a piss artist's impression. It might be that we're moving closer to knowing what we're going to be watching. The current options seem to extend to the status quo and the little heralded 12+12+18 format, the Hampden zinger that was the only method they could devise that would leave fans feeling nostalgic for the "race for the top six." I don't know how many clubs are already selling season tickets. I hear that sales at Easter Road are going well, although I think that particular barometer will be a better gauge when the current interest free payment offer runs out and the real extent of Pat Fenlon's underachievement becomes clearer. When we're not being kept in the dark we're being told that we have to accept the medicine proscribed by a vacuous leadership that insists we don't know what's good for us. Maybe I don't know what's good for me. But if football needs fans and football keeps treating fans with contempt then football is fooling itself. I chuckled on Sunday when a tabloid reported that David Cameron was ready to force the issue of the Old Firm moving to England. Not only had the paper run with such an obvious howler but they'd alighted on one of the few high profile leaders whose current form matches Scottish football's heid bummers for donkey-ness. Where there is dischord they bring more dischord. Or apathy, which threatens to be even more damaging. "We need you fans. Ignore the fans. We need the fans. We don't care what the fans want." It's an odd attitude to adopt. Sometimes I think George Orwell could have done a job on Scottish football. Then I remember that the pigs of Manor Farm at least started out with good intentions. Maybe we'll be surprised. 12+12+18 will be agreed this week, the benefits will become clearer, the excitement will return. The dreams of the suits will become a fanfare for the common fan. Or maybe it will be another failure on the road to ruin. And my muppetry is partly to blame. For the price of a week in an unfinished hotel in Benidorm I've legitimised the idiocy of the men who are failing to save the game. There's no hope for me, undisputed muppet of the West Stand. Hopefully Scottish football isn't such a lost cause. When I heard the news that my good friend Scott Johnston, of thefootyblog.net "fame", was walking to Lille with his longtime guy pal and French football fanatique, Andrew Gibney, I thought they'd set themselves a bizarre test of their bromance strength. That might well be the case. But they're also challenging themselves for the greater good: 127 miles across England, Belgium and France to raise funds for the MS Society. Joining them are the apparently sane Chris Mayer, Lewis Skinner and Nick Crookes, the five of them raising funds to fight a neurological condition that affects around 100,000 people in the UK. The trip was inspired by Andrew's father-in-law who suffers from multiple sclerosis. It's a condition I hear about regularly but, I suspect like many people, don't take a lot of notice of. It was only after Scott started speaking about this fundraising idea that I realised that most people are diagnosed between the ages of 20 and 40. Which, perhaps selfishly, rammed home the relevance of what the guys are doing. A worthwhile cause and a unique way to fundraise, with clubs from Sheffield to Brugge via Rotherham helping out along the way. 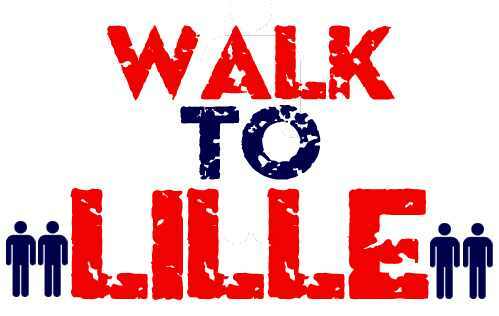 The famous five set off on Friday and will arrive in Lille the following week, having clocked up 20 miles a day. My advice to the walkers - take plenty of suitable swaddling for the blisters and insist Scott tends to his own chafing injuries. My advice to everyone else - give generously for a great cause.